As Arnaud Desplechin’s new film Les Fantômes d’Ismael opens the Cannes Film Festival today and is now showing everywhere in France, I have updated the video area and gallery with Marion’s interview on France 2’s Stupéfiant – a 20 minute personal interview with the actress where she discusses her career choices and some of the directors she’s worked with -, a few photos of Marion’s arrival in Cannes yesterday, a few stills from the new film and some events I had not yet had the opportunity to add to the gallery. On top of that, we have a new design, which I hope you guys like as much as I do. I’m going to keep updating the site with Marion’s appearance in Cannes today so keep checking back! Last night was the Parisian premiere of Guillaume Canet’s new comedy Rock n Roll. The premiere, which took place at the Pathé Beaugrenelle cinema in the south of Paris, also marks the end of the Rock n Roll tour in France, which has taken the director and actors across the country to promote the film through special screenings. Although Marion has not been present to all of the screenings, she made an appearance last night, along many other of the film’s cast and crew, wearing a Filles à Papa outfit. You can check the high quality photos of the event in the gallery! I have finally managed to add the missing portraits to the gallery and complete several sets of photoshoots. I have added shoots dating back to 2001 and up until this year so be sure to check them out. Thank you so much to Sairentu for finding a lot of these and sending them to me so I could add them to website! I have also replaced low resolution photos for better ones in several photoshoots so if you are fond of a particular shoot, be sure to re check as they might be in better quality now. Note: A few of these are tagged due to the high price I paid for them. The world premiere tour for Robert Zemeckis’ film Allied ended in Madrid on November 22. Marion, Robert Zemeckis and Brad Pitt visited a few cities on the tour after the premieres in Los Angeles and New York. The team came to Europe and hit Paris, London and Madrid to present special advanced screenings of the film. 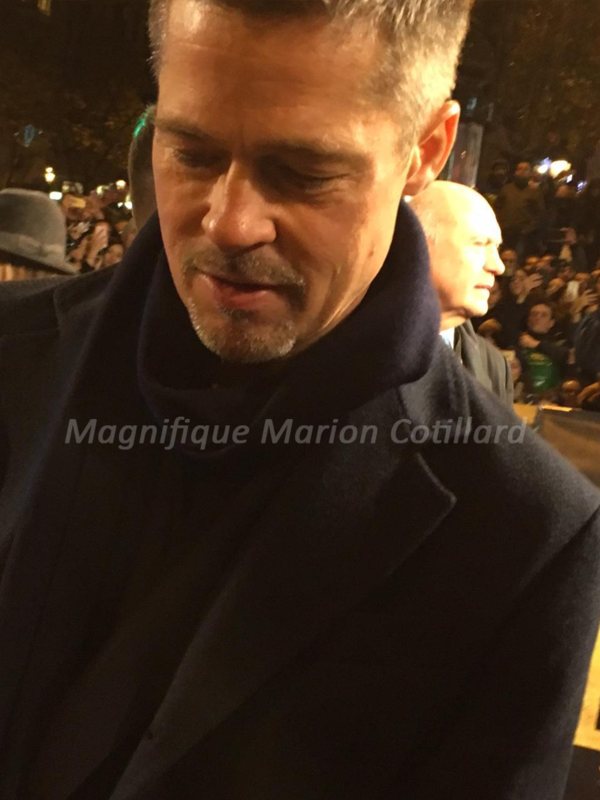 I managed to attend the premiere in Paris and take a few photos of Marion and Brad! They are both incredibly sweet and nice to the fans, and it was truly a pleasure to see them up close! I have added high quality photos to the gallery of all their appearances. Serena and I also added every Allied interview we could find, as well as some more promotional material. We have also added new stills and artwork for the film so be sure to check the gallery and the video section for what’s new! Paramount Pictures, The Cinema Society and Chandon hosted a special screening of Allied in New York City last night. Marion Cotillard, wearing a Rochas outfit from the Rochas Resort 2017 collection, attended the event accompanied by director Robert Zemeckis. Check out the high quality photos in the gallery.